For most of us it is about turning the lights off, using less water, buying energy efficient appliances, turning down the thermostat in the winter and turning up the thermostat in the summer. Converting to a high efficient furnace with a DC motor will save money too. 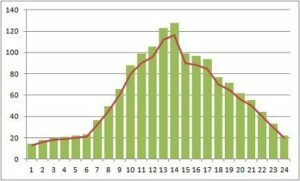 If you have a time of day electrical system with peak rates and off peak rates you can shift energy use to the off peak times. 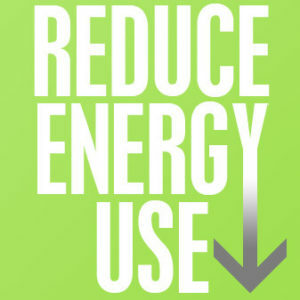 This step does not reduce energy use but it does reduce your overall cost. Get into the habit of turning the lights off when no one is in the room. Adjust the thermostat , talk about it with the family. Get them involved as you try to manage energy use. It may take some time but they will gradually become converts! You may even have to provide some sort of incentive to help them form the habit of always turning off lights for example when they leave a room. Increase awareness about how to manage energy use can mean that you talk about it with the family. Get them involved and provide them with an incentive. Maybe a small trip with the savings. When you manage energy use, you save money so that it can be spent on other things that are more important to you and your family. Sometimes examples are helpful. Showing them the bills and letting them know how much things cost sometimes helps. If a heating bill is much higher than normal, this is something you can discuss with the family and explore reasons that it is so high and what all of you can do to reduce the cost of heating in future months. Reducing energy use has become a favorite pass time for many people these days with the increasing cost of oil, gasoline, electricity and so on in the news almost all of the time. Every day the price of oil is quoted to give everyone some idea of where the price of gasoline is headed. When it goes up gasoline increases in price. In addition everything that is remotely related to gasoline goes up as well. If oil is used as a byproduct to make something the price is impacted. Whether it is to run an engine in shipping or farming as an example it is going to cost more. The prices for goods are going up as well. At the time of writing, oil prices are at $108 and headed higher, which means the price of anything produced with oil is going to increase. Gasoline is over $4.00 a gallon in the US and over $1.30 a liter in Canada. In case you are wondering at $1.30 / liter is equivalent to $5.00 a gallon. They expect prices to go even higher which makes a lot more worth our while to reduce our energy use and save money on the bottom line. How Can Consumers Reduce Energy Use? Aside from just using less fuel and less electricity etc, consumers can use less packaging, less plastic bags and on and on to make a contribution to reducing energy. The first step of course is to apply reducing energy use in things you control and directly affect your wallet. This is gasoline you use in your car, electricity you use to do virtually everything in your home and office and fuel for heating your home or running small garden tools around your home. We have written several posts about reducing energy use in this manner on this blog. Consumers can literally save hundreds of dollars a month by cutting back just a bit in their energy use. In some cases consumers must take a stand and not purchase products that are energy hogs which will send a message to manufacturers. If you must purchase something, then send a message by buying items that use far less energy in your everyday use. The best example is deciding to purchase a car that gets really great gas mileage vs. one that maybe looks better, has more power but uses a lot of gasoline per mile. You may not want to pay a premium for a battery operated car or one that is battery assisted, but you can purchase a car that gets in excess of 30 miles to the gallon or higher to reduce your own personal energy use and decrease your overall cost to operate a car. Walking or biking to work is another approach that really has benefits. Not only do you save money, you get some exercise as well which will help in your overall life. Most appliances are not manufactured with an energy star rating. Purchase those that have the best ratings overall. In fact every time you purchase an electrical device, check out how much energy it uses and if there is something more efficient available. Upgrade your furnace to high efficiency for example. You will save on fuel as well as electricity when you upgrade. Take advantage of incentive programs offered by your local government. Many offer to provide rebates when you upgrade a furnace or air conditioner to a more efficient model. These subsidies can amount to hundred of dollars. If you have not converted all of your light bulbs from incandescent to either LED or fluorescent bulbs you should do it now. This is actually a quick win in terms of energy use reduction. Look for coupons and incentives to buy these newer bulbs at a discount. You can immediately begin saving money when you install these efficient light bulbs and the payback is relatively short. You can easily calculate the savings by using some of the calculations on the packaging and applying your current energy rate for electricity that is provided in your state. If you plan to be in your home for a long time, investing in LED lights, which are expensive, can payback as well relatively quick. Take a few minutes now to review some of our other posts about specific things you can do when reducing energy use in your home and office. 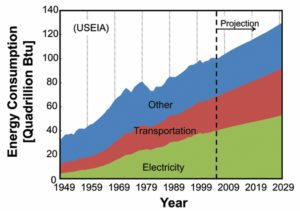 The chart on the left forecasts how fast the energy consumption curve is growing. Also how it compares to past years. If this chart does not persuade you that we should find ways to promote the efficient use of energy, then I do not know what will. Consider that our energy growth is continuing at a high rate. Although we are finding more and more ways to generate energy, it is costing us more and more all of the time. With demand growing, and supplies being limited, there is no question that the price we pay for gasoline, for electricity or for natural gas is going to increase. The only way for us to offset this cost is to make sure that we are making efficient use of energy in all situations. Our transportation, our homes and were we work are the three big consumers of energy. We will cover a few of these in the following paragraphs for each of these areas. The single largest expense for transportation is our car that we use to go back and forth to work. As well as for leisure activities. The price of fuel is going up all of the time. Anything we can do in this area reduces our energy consumption. It also saves us money and helps our bank account. Making sure that the tires are properly inflated, that the engine is tuned up, that the car itself is a gas miser and driving in such a way that we conserve gasoline are all ways to improve the efficiency of our cars. Minimizing jack rabbit starts and stops. Ddriving at the speed limit really make a huge contribution to gas savings. Even 10 miles over the speed limit will cause your car to work harder. It will deliver fewer miles per gallon than it would at the speed limit. Can you take the bus to work? If so you can save in a lot of ways. Reduced gas consumption, reduced wear and tear on your car. Also no parking to pay for, reduced insurance costs, fewer accidents statistically. The bus is a lot more efficient especially if you are taking express buses that are full. It may be an inconvenience to take the bus. It may take more time. However it is a lot less stress on you as a driver. You are making efficient use of energy which saves you money in the long run. 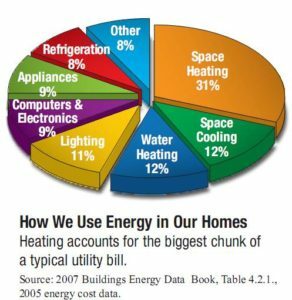 Our homes are another big contributor to the energy we use. Heating and cooling, along with the water we use are the main users of energy. Insulating our homes better, adjusting the thermostat to save cooling and heating costs, updating windows and doors to be better insulators and generally making our homes more efficient will make a huge contribution to energy efficiency. We have several detailed pages on this website about how to reduce energy use in the home. These savings put more money in our bank account. We can also make more efficient use of energy in our homes by managing the waste we generate. All of the packaging and the things we use that breakdown and then get thrown out contribute to a lot of energy use in their production and then in landfill sites that we fill. Every time we purchase something give some thoughts about how this can be reduced. Use recycling bins for paper and cans so that these things do not end up in the landfill sites. Be a minimalist and save thousands of dollars a year! We have more influence at work than we think when it comes to energy reduction. For those people in management, it is pretty obvious. Anytime you and your team can work smarter, more efficiently etc the company makes more money. You are reducing the energy that is used. Influencing lights being turned off, computers shut down at night, the trash that gets generated, how buildings are designed. Also how products are manufactured etc are all specific things that many of us can make a large contributing to. Take a look at your work location and assess today what you can do to reduce your company’s energy foot print. You might be surprised at the savings and even be rewarded for it as well. When we started looking at this question of which appliances use the most electricity, we thought that intuitively we knew what the answer would be. The oven, the furnace, pool pump and appliances with motors would be the heavy users. And yes these appliances are in fact heavy users of electricity; however they are not even close to the big one. It turns out that central air conditioning and heat pumps are the big consumers of electricity for two main reasons. First there are two electrical motors that are running when these appliances are in use and they are typically large motors that consume a lot of electricity, up to 15,000 watts on average per hour. On top of that we tend to run our air conditioners for a long time particularly if it is really hot compared to other appliances such as an electric range, a clothes dryer etc. They use a great deal of energy during the summer time. The cost to run an air conditioner that is consuming 15,000 watts per hour during the day time during peak hours can be as much as $1.60 per hour; while at night when rates are lower the cost can decrease to around 75 cents per hour or half of the rate that is charged during the day. We are assuming 11 cents per kilowatt during the day and 6 cents during the evening. Clothes dryers will use 4000 watts per hour, while a hair dryer is down around 1200 watts and the incandescent light bulb is down around 60 watts. Electricity usage is all about the math. For example let’s assume the average home has 10 light bulbs, all incandescent and are on for an average of 3 hours per day. This amounts to 1800 watts per day or 13,600 watts per week. The dryer on the other hand might be used for 30 minutes several times a week, let’s assume 4 times per week. This calculates to 8000 watts of total usage over a weeks’ time. We all want to cut down on electrical usage and now you can understand why everyone wants to switch to fluorescent bulbs or LED bulbs which reduce the electrical usage significantly. The following chart attempts to hi-light the usage levels and costs of these appliances. You can vary your own assumptions; however we think that in general you will come out to the same conclusions. Note that for the incandescent lights are assumed to have 10 light bulbs that are on for 7 hours a day on average, for 7 days. When you add in the number of hours of use on average every week, it really changes the picture. the air conditioner is of course the highest, but what is really surprising is the cost of leaving lights on that are incandescent. Switch to fluorescent and you can save a tremendous about of electricity. Reduce the number of hours your air conditioner is running by turning up the temperature on your thermostat and you can significantly reduce the amount of electricity that you use. You might argue that the assumptions in terms of how may hours we assumed, however just substitute your own to calculate the cost. We do not think that the conclusions will change. Building energy use is becoming more and more important as the cost of energy is increasing. It does not seem to matter whether it is electricity, gas, oil or whatever, they are all going up by leaps and bounds contrary to what the government says. The 13% on the circle on the left represents uncertainty in the data, or in other words it could not be easily attached to any of the other categories. The chart above is pretty interesting since it depicts how we use energy on average for our homes since the industrial sector is excluded from these calculations. It also tells us were to focus our energy in terms of reduction in the use of fuels to get the most bang for our investment in money and time. Our total annual energy cost for 2011 was $2952.00 for electricity, heating and water. We decided to include water here since it is a form of natural resource that we are slowly using up. Using the percentages from the chart above we calculated how much energy we used from last year in terms of a dollar amount. We assumed that we are an average user. You can see these cost amounts in the 3rd column below. Next we assumed a 10% reduction, only for the big ticket items to assess how much we might save in dollar terms. Ten percent should be pretty simple to meet as an objective. 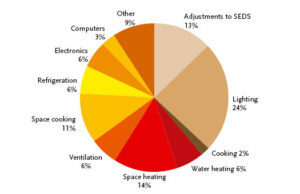 These numbers are in the last column and were only calculated for anything 6% and over assuming we could take steps to reduce energy use in these areas, including the SEDS which is the unidentified energy use. The total savings added up to $280 in savings over a year or 9.4% over all. This actually should be quite achievable for most people. The answer is pretty easy. These are just a few suggestion to help you get started saving energy. In fact you will likely save much more than just 10% if you are able to get the entire family involved in reducing your energy consumption. Building energy use is only going to increase over time. It will help now to minimize the usage and the cost by employing some or all of these suggestions. These figures are for residential use and although important to the average home owner are far more important to any industrial building owner which we have not reviewed here at all. These are just examples, which can be applied to almost any home! Get started now with identifying those areas that can reduce your energy use. For more information about conserving energy and energy use in buildings, click here. 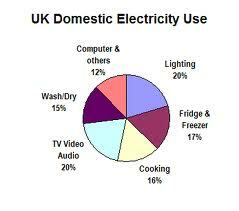 We have shown a number of graphs on previous posts as well as this post about electrical use by household appliances. They all vary to some degree simply because the assumptions are different in every case. This is due to personal requirements, living styles, climate and rates that people pay for electricity. What does not seem to change very much are the energy hogs. Or the culprits in terms of which ones use more electricity than others. For example if you own a pool or spa, run your air conditioning a lot, chances are that these appliances will be the big spenders of electricity unless you do something to control them. The major appliances are the next group were energy use by household appliances are high. Your fridge, washing machine, clothes dryer, freezer, electric ovens, and dishwasher are as a group the big set of offenders. They all have motors of some kind and they all run a lot. The amount of electricity they actually draw depends on many factors peculiar to your personal taste as well as the type of appliance and how energy efficient it is in the first place. For example we have a freezer which is a big energy hog, but we only run it for a month around Christmas time when there is lots of family coming over and we need to have food available. After the festivities we store some of the left overs in the freezer. This step alone probably saves us $170 a year in electricity cost. While this may not seem like a lot of money to some people, when you add this savings along with other savings you get from upgrading your fridge for example to a more efficient model ($125), changing all of your lights to fluorescent ( $12 / light) and on and on. Pretty soon you have saved yourself over $500 a year in electrical charges which is significant. There are also special items that not everyone has. We all have for the most part 4 major appliances and some have a 5th i.e. a dishwasher. But what about aquarium pumps, dehumidifiers and microwaves. These devices also use electricity and they can bring much enjoyment to the owners ( aquariums ) , however they come at a cost. An aquarium is estimated to cost around $40 per year to run the lights and the pump. There are many other devices which contribute to power use, however each person must make their own judgement regarding how far they want to go to save money and to save electricity or energy. None of these graphs really focus on lights, yet our parents always told us to shut the lights off when we left a room. Each individual light does not use that much energy by itself, however there are two principles at work year. One is all about habits. That is forming the habit to turn things off when they are not being used. If you turn the lights off as part of a habit that you have formed chances are this will apply to other appliances as well. For example TV’s and computers for example. The other principle here is that every little device, including lights use electricity. While they do not use much electricity by themselves, they do use a lot as a group when you add them all together. By focusing on this group and turning off all devices when they are not ins use will have the same effect as controlling or managing the use of a large appliance. If you are really motivated because you need to save money or just because you want to do your part to reduce your energy foot print this is another area to focus and reduce electrical use. Adding lights, TV’s, home computers for example together can save you a hundred dollars or more, which makes it definitely worth while to reduce your costs. Every little bit counts and it is one of the big reasons we urge consumers to focus on the big items first, then take a look at the smaller items such as light bulbs and conserving energy. Over a year even these small items can make a big contribution to reducing our energy consumption. When it comes to appliance energy use and trying to reduce your energy footprint, I like to apply the 80:20 rule. Focus on the things that are going to save me a lot of money vs. those that may save me very little. Once I have gained as much as I can, only if it makes sense from a ROI(return on investment) will I take a look at the smaller savings to be gained. One light bulb may not save much when you convert from incandescent to florescent lights. Converting all of your lights can begin to add up. In a previous post we talked about how converting three lights would save $29 per year. When multiplied across all of our lights inside the home, would add up to much higher savings. What Appliances Cost More to Operate? So which appliances cost more to run? Well it depends on your personal use of these appliances, the rate you pay for power and of course their energy rating. For example, in our location air conditioning costs us approximately $150 per year. Running ceiling fans may cost us $20 / year for the same period instead of using AC. Cooking with an oven at 350 F 15 days a month for an hour on average may cost us$43. Heating with a microwave will cost us about $32, although a microwave is much more efficient and does not need to be run as long as the oven. That new plasma TV you leave on all day will cost as much as $88 a year. Reducing the number of hours that you actually watch it will reduce the cost by perhaps half to $44. The same LCD sized TV will cost $20 less or $68 a year to operate with the same assumptions. Even while not on these devices still consume energy, but it only represents a few dollars per year times the number of devices that you actually have. None of these amounts are huge dollars, unless you run your AC for extended times. Many people do have to do in southern climates, it really means that you have to get into the habit of turning things off all of the time. Run your appliances in non peak hours, and convert to less expensive appliances in terms of energy use. This is the only way you are going to get control of your energy cost and minimize this cost as much as possible. Convert all of your lights that are on a lot to florescent lights. When you purchase appliances, go for the energy efficient ones. When you walk out of a room, turn the lights off, turn the TV off etc. Run your AC less and if you are not at home, turn your AC temperature up so that it is not running unnecessarily. If possible delay electrical use into non peak times. In our case that means running the dishwasher and the dryer after 7pm at night or on the weekends. I also turn the pool pump off during the day so that the pump is not drawing electricity during the day when rates are at their peak. Appliance energy use is just part of the equation. What is about to change is the use of electricity to charge our new cars. Hybrid cars do not require to be charged from the electrical grid, however purely electrical cars must be charged from the grid. The best time to charge these vehicles will be at night when the non peak rates are available. You will save money by driving an electric vehicle. However you can manage this cost as well by controlling when you actually charge the car. In reality it is just another appliance that just uses energy. As usage goes up and more investment is required. The electrical companies will be increasing their rates even further than they already have. As time goes on it will become even more important to manage your appliances energy use. It will become more important to control your monthly electrical cost. We will be writing a lot more about this subject in coming posts so stay tuned! 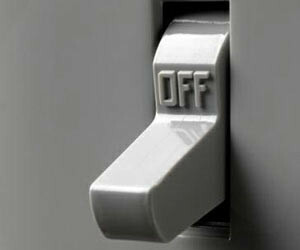 For more posts about energy use and how to reduce the energy you use, click here. Every appliance uses energy, some better than others and there are many variables that go into an estimate of the energy use of appliances. For example, how often do you use an appliance each day, each week or month? Are they used all year round? What capacity is your appliance? What rate are you currently paying to your provider and do they have a peak rate, a medium rate or an off peak rate. Do you use this appliance in these various time frames that correspond to these rates? With so many variables, how does the average consumer figure out what an appliance is going to cost him or her and do they really care. Perhaps it is not even worth the effort to figure out all of this stuff. Bottom line is that if you are not using it and have it turned off, the appliance is not going to use energy unless it has a keep warm feature such as TV’s and computers. In this case they use less energy, but they are still using energy. In today’s modern world we use energy in so many ways that we now take almost all of it for granted. How Do We Use Energy does not concern most people. Just about everything we do from morning to-night when we go to bed, involves using energy and in fact we use energy even when we are asleep. Most of this energy use is electrical usage. Our ancestors used energy too but not at the same rate that today’s modern civilization does today. For example, our ancestors probably had a fire going to keep them warm. The fire burned wood to generate the heat. They used a very small amount of energy compared to us today. We consume natural gas, oil or coal to heat our homes, we consume electricity to also heat our homes and run just about everything in it. All of the things we have in our home consumed energy when it was manufactured including electricity, oil, gas and raw materials. Our cars run on gasoline and it takes huge quantities of energy to make these cars. Even if we take mass transport to get to and from work we are consuming energy as well, although it is much more efficient. We are never going to back to the caveman approach with regards to energy. The real question is how do we become more efficient and use less energy per person each day to conserve our raw materials and decrease the hit on our pocket book? Using energy efficiently must become part of our every day life. Something we think about each time we consume energy and each time we waste it. If all of us could reduce our consumption by at least 10%, there would be a huge impact on the environment, our cost to ourselves and a general improvement to our overall lifestyle. Ten percent is not a huge objective and for most people could be easy to achieve. We are going to list a number of things that all of us can do to conserve energy. If you are already doing some of these great, there is always more you can save. If your are just getting started, you will see that it is easy to achieve 10% savings. And it will hit you right in the pocket book, with reduced cost to you and your family. If we missed some, leave us a comment and we will be happy to include your item on the list. The list can go on and on. Send us your items and we will be happy to add to the list to help everyone conserve energy. Remember how we use energy contributes to our overall cost to ourselves as well as the environment.